As a high school student, many of my teachers labeled me ‘DUMB.’ Of course I knew who the real dummies were. I barely graduated from high school. There was no way I was going to college–I never even thought about it. I could barely read my textbooks. 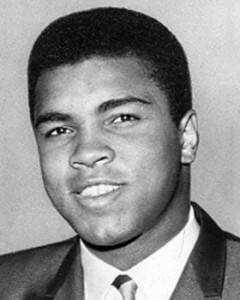 Muhammad Ali achieved fame as a professional boxer, and is generally considered among the greatest heavyweights in the history of the sport. He was an Olympic Gold Medalist, an inductee into the International Boxing Hall of Fame, and World Heavyweight Champion. A controversial and polarizing figure during his early career, Ali later became highly regarded for the skills he displayed in the ring plus the values he exemplified outside of it: religious freedom, racial justice and the triumph of principle over expedience.